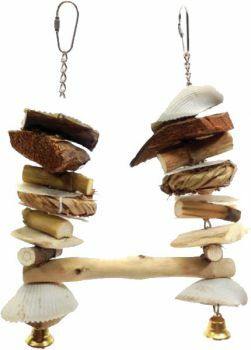 The Sea Shell Swing for birds has java wood, branches, natural woven fibers, and seashells hung on either side on the java perch. Your bird can beak, chew and swing for hours. At the bottom of the swing there are two liberty bells for your bird to play with. This toy won Best Bird Product at the 2010/2011 world renown SuperZoo trade show. Notify me when XS Sea Shell Swing-AE Java Wood is in stock.